What is the sudden hype about cryotherapy? Why are more people turning to cryotherapy? Our constant exposure to things like stress, overuse of antibiotics, inflammation, and poor food choices gradually weakens our immune system. The weaker our immune system, the less it is resistant to disease. So How does Cryotherapy help? The overall result is that every organ is positively affected and the body begins the self-healing process. What to expect at my cryotherapy appointment? 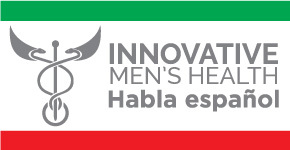 At Innovative Men’s Clinic, we provide you with gloves and socks to prepare you for your treatment. Once ready, you will step inside our Cryo Sauna where you will be gently misted with liquid nitrogen from the neck down for 2-3 minutes. It is through this process of cooling the body at such extreme temperatures with a dry, non-toxic mist, that inflammation is dramatically reduced. Clients leave feeling warm, renewed, and energized due to a natural release of endorphins and a metabolic spike. The process of dilating blood vessels enables the nutrient rich blood to return to tissue and flush out toxins for a full body reset. What is Cryotherapy and how is it used? Why do athletes love cryotherapy? Why is Hollywood in love with cryotherapy? How does cryotherapy help with aging and wellness? Would like to try this innovative approach to doubling your energy levels, improving recovery, reducing aches, and keeping your immune system strong?